A meticulously executed paint job adds elegance and beauty to your home. A fresh coat of paint for your business makes it more inviting and attractive to customers. The first impression is always the most lasting. A newly painted interior or exterior not only makes a great impression, it also increases the enjoyment you have while being in your home or office. Don’t let your home or business look tired and unappealing! Trust your painting to Ross Painting. 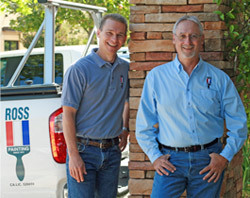 We are painting contractors based in Marin County. We have been painting home sand businesses throughout the San Francisco Bay Area for more than 25 years. Our master painters can take on any size of project, from a single family home to a multi-unit homeowners association or commercial office building, shopping center or church. We have hundreds of satisfied customers who pick up the phone and call Ross Painting, again and again, whenever they need a painting contractor for touch-up painting or a complete repaint.